(1)P Unless otherwise stated in Part 1 of Eurocode 9 the terminology used in International Standard ISO 8930 applies. - Fatigue: Weakening of a structural part, through gradual crack propagation caused by repeated stress fluctuations. - Fatigue loading: A set of typical load events described by the positions or movements of loads, their variation in intensity and their frequency and sequence of occurrence. - Loading event: A defined loading sequence applied to the structure, which, for design purposes, is assumed to repeat at a given frequency. - Nominal stress: A stress in the parent material adjacent to a potential crack location, calculated in accordance with simple elastic strength of materials theory, i.e. assuming that plane sections remain plane and that all stress concentration effects are ignored. - Modified nominal stress: A nominal stress increased by an appropriate geometrical stress concentration factor Kgt, to allow only for geometric changes of cross section which have not been taken into account in the classification of a particular constructional detail. - Structural stress (also known as 'geometric stress'): The elastic stress at a point, taking into account all geometrical discontinuities, but ignoring any local singularities where the transition radius tends to zero, such as notches due to small discontinuities, e.g. weld toes, cracks, cracklike features, normal machining marks etc. The structural stress is in principle the same stress parameter as the modified nominal stress, but generally evaluated by a different method. 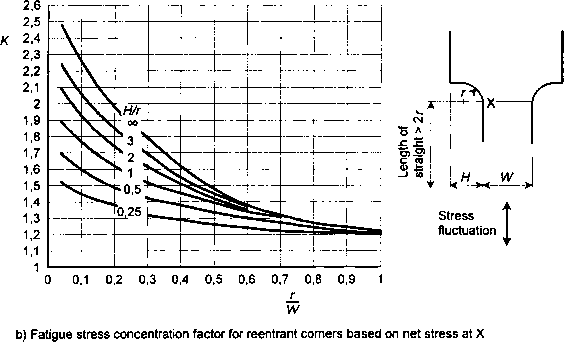 - Geometrical stress concentration factor Kgt: The ratio between the structural stress evaluated with the assumption of linear elastic behaviour of the material and the nominal stress. - Hot spot stress: The structural stress at a specified initiation site in a particular type of geometry, such as a weld toe in an angle hollow section joint, for which the fatigue strength, expressed in terms of the hot spot stress range, is usually known. - Local stress concentration factor of a classified detail Kcd: The ratio between the peak stress evaluated with a particular finite element method (FEM) analysis at the hot spot of a classified detail and the nominal stress. - Stress history: A continuous chronological record, either measured or calculated, of the stress variation at a particular point in a structure, (usually for the duration of a loading event) (see Fig. 1.5.1). - Stress turning point: The value of stress in a stress history where the rate of change of stress changes sign (see Fig. 1.5.1). - Stress peak: A turning point where the rate of change of stress changes from positive to negative (see Fig. 1.5.1). - Stress valley: A turning point where the rate of change of stress changes from negative to positive (see Fig. 1.5.1). (Also known as a 'stress trough1). 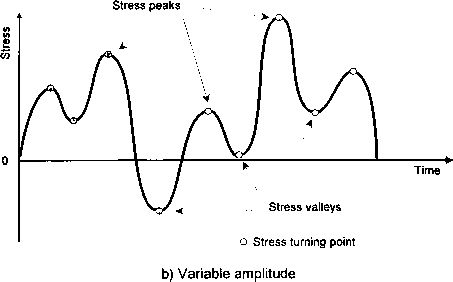 - Constant amplitude: Relating to a stress history where the stress alternates between stress peaks and stress valleys of constant values (see Fig. 1.5.1). - Stress cycle: Part of a constant amplitude stress history where the stress starts and finishes at the same value but, in doing so passes through one stress peak and one stress valley (in any sequence). Also, a specific part of a variable amplitude stress history as determined by a cycle counting method (see Fig. 1.5.1). - Cycle counting: The process of transforming a variable amplitude stress history into a spectrum of stress cycles, each with a particular stress range, e.g. the 'Reservoir1 method and the 'Rain flow' method (see Fig.4.4.1). - Stress range: The algebraic difference between the stress peak and the stress valley in a stress cycle. - Stress-range spectrum: Histogram of the frequency of occurrence for all stress ranges of different magnitudes recorded or calculated for a particular loading event (also known as 'stress spectrum'. - Design spectrum: The total of all stress-range spectra relevant to the fatigue assessment. 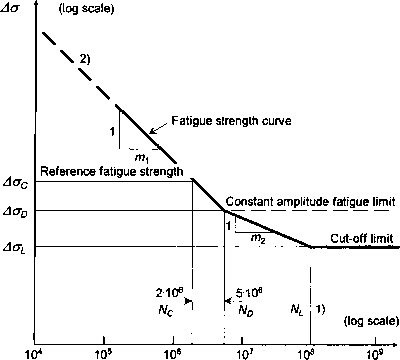 - Detail category: The designation given to a particular fatigue initiation site for a given direction of stress fluctuation in order to indicate which fatigue strength curve is applicable for the fatigue assessment. - Endurance: The life to failure expressed in cycles, under the action of a constant amplitude stress histoiy. - Fatigue strength curve: The quantitative relationship relating stress range and endurance, used for the fatigue assessment of a category of constructional detail, plotted with logarithmic axes in this standard (see Fig. 1.5.2). - Reference fatigue strength: The constant amplitude stress range Aac for a particular detail category for an endurance N = 2 x 106 cycles (see Fig. 1.5.2). - Constant amplitude fatigue limit: The stress range below which value all stress ranges in the design spectrum must lie for fatigue damage to be ignored (see Fig. 1.5.2). - Cut-off limit: Limit below which stress ranges of the design spectrum may be omitted from the cumulative damage calculation (see Fig. 1.5.2). - Design life: The reference period of time for which a structure is required to perform safely with an acceptable probability that structural failure by fatigue cracking will not occur. - Safe life: The period of time for which a structure is estimated to perform safely with an acceptable probability that failure by fatigue cracking will not occur, when using the safe life design method. - Fatigue damage: The ratio of the number of cycles of a given stress range which is required to be sustained during a specified period of service to the endurance of the detail under the same stress range. - Miner's summation: The summation of the damage due to all cycles in a stress-range spectrum (or a design spectrum), based on the Palmgren-Miner rule. - Equivalent fatigue loading: A simplified loading, usually a single load applied a prescribed number of times in such a way that it may be used in place of a more realistic set of loads, within a given range of conditions, to give an equivalent amount of fatigue damage, to an acceptable level of approximation. - Equivalent stress range: The stress range at a detail caused by the application of an equivalent fatigue load.